Your Parisian opportunity to get in touch with the latest contemporary lighting trends is over! Equip Hotel 2016 took place in Porte de Versailles, Paris, between the 6th and 10th of November and for you lighting lovers it was definitely something to schedule up on your Agenda. After all, Paris is always a good idea! Isn´t it?! SEE ALSO:PREPARE FOR HALLOWEEN WITH SOME CONTEMPORARY LIGHTING IDEAS! So here are some awesome brands and interior designs that made their presence in Equip Hotel 2016. You would definitely love them! This one is an original lighting design from Ombré Portee, it´s made of Brass. Isn´t a great table Lamp? Surprisingly it´s actually 5* 25 inches, it looks bigger right?! Just imagine this lamp on your nightstand table!! This interior design has a hand of Alba Decoration, that floor lamp just fits perfectly in any living room! 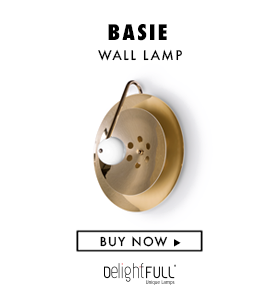 It´s big and it actually sheds a great amount of light, so its the perfect piece to fill in a big room! Here is another set from them, they could be setting trends! Just look at this outrageous floor lamp design, the wood mixed with the back metal finishes goes pretty well! ACB was also at Equip Hotel 2016. Look at their style? Great, right? The white is always a “go to” color and if it´s combined with the right pieces of furniture it will obviously look amazing! They say to save the best for last! So just imagine this awesome chandelier from DelightFULL in the exposition! YEAH! It´s so beautiful, isn´t it?! But more surprises from this brand are coming, so keep up with us and keep scrawling! DelightFULL teamed up with Studio Hertrich & Adnet! Here is one of their projects! They are completely outrageous and awesome! The colors and arrangement of the room are just absolutely unpredictable, it looks like everywhere you look as a new exciting detail! Anyway! Keep scrawling…the best is yet to come! Here is the final overlook!! Don´t you just love it?! It is such a beautiful interior design and has for contemporary lighting inspiration, I would give it an A+! It was the Show Bar, an extravagant and classic space reserved for special clients. DelightFULL and Studio Hertrich & Adnet only an amazing project could come out of it! I hope you were able to see all of this lighting inspirations on your own! Has a reader of our amazing Blog you must definitely deserve it! But you know what? We have more inspirations for you at a distance of a click! SEE ALSO: PREPARE FOR HALLOWEEN WITH SOME CONTEMPORARY LIGHTING IDEAS! Time to Start Getting Ready for Maison et Objet September!